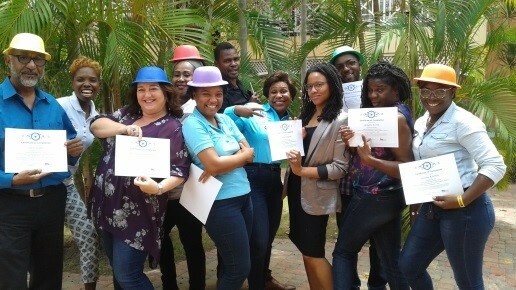 Recognizing that learning interventions are only as good as the people who design them, FHI 360 through the USAID-funded activity Local Partner Development (LPD), is committed to further develop the professional skills of Jamaican trainers in the civil society sector. It is in this light that core partners of LPD, to include staff of RISE Life Management Services, training consultants, along with LPD staff members, participated in a three-week Learning Design and Delivery “bootcamp”, to strengthen the team’s ability to develop effective capacity building programs and interventions. To gain insight on designing excellent student learning experiences, LPD leveraged the depth of knowledge and experience in the global FHI 360 network and secured the services of Lisa Moreau, Technical Advisor. Ms. Moreau, a noted learning designer and innovator, designed and implemented the three-week Learning Design and Delivery session to introduce the LPD team to key principles in adult learning, with a specific focus on the ADDIE (Analysis, Design, Development, Implementation and Evaluation) model. The sessions were designed around interactive and immersive learning activities, where participants did practical exercises to develop an understanding of the key principles in designing effective interventions targeting adult learners. The learning continues as the LPD team now integrates the information acquired throughout all aspects of the capacity building program. The learning design workshops have empowered the LPD staff and their training partners, with the knowledge needed to create thought provoking and impactful capacity building initiatives and workshops. LPD is committed to ensuring that the interventions provided to civil society organizations are effective and easy to understand, creating real behaviour change and improved organizational performance.